A new clinical trial in which cancer patients are given a chemotherapy drug delivered directly into their tumors is giving hope to people with a highly aggressive type of brain cancer. Chris Amundsen is one of them. 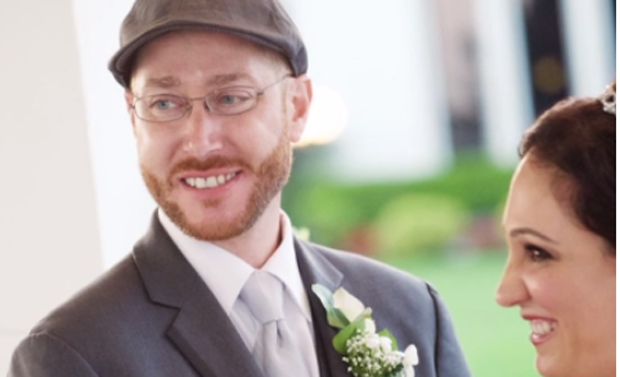 The 37-year-old and his wife Laura sped up their wedding after he received the devastating news that has an often fatal brain cancer called glioblastoma. "It was kind of a shock," he told CBS News. "It's a scary name, but at the time I really didn't know that how life-threatening it was." But the news got even worse. "They told us I should take off from work and spend as much time with him because it would be my last summer with him," Laura said. Yet the couple refused to give up. They found an experimental drug treatment program at Lenox Hill Hospital in New York City directed by Dr. John Boockvar, and Amundsen soon enrolled. "So this clinical trial is novel because we're giving a high dose of the medication that we normally give by mouth directly into the tumor," Boockvar said. A catheter is placed in the patient's groin and threaded to the brain, so that a higher amount of the drug goes directly to the tumor. "And thereby limiting exposure to the rest of your body of that drug," Boockvar explained. Amundsen was the last patient enrolled in the first phase of the clinical trial, so he was allowed to receive a higher dose compared to other patients. The second phase is about to roll out and will determine the effectiveness of the treatment. The ultimate goal is to keep Amundsen's tumor from growing, and so far it has remained the same size. "I'm hoping this kills the tumor completely. I know that may not happen but I'm still hopeful for it," Amundsen said. For now, he and his wife are planning their future which includes starting a family.